I hope you’re following the journey that led me to launch Literacy Matters. If you missed it, you can find the first installment where I learned to love books, at this page. 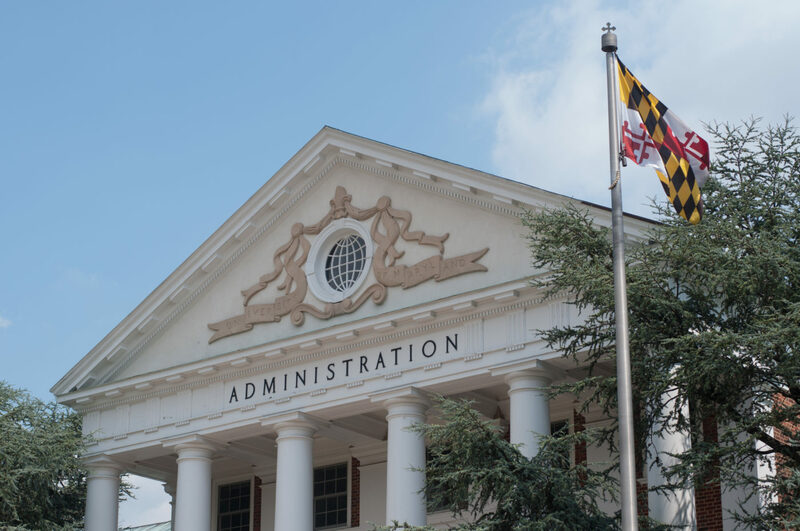 At the University of Maryland, I majored in Early Childhood Education and earned a Bachelor’s Degree. My early career included teaching 3rd grade at Sandy Mount Elementary School in Marlow Heights, 2nd grade at Flintstone Elementary School in Oxon Hill, and 1st grade at Holy Family in Hillcrest Heights. Returning to Holy Family as “the teacher” was quite a surreal experience. The building was just as I remembered – I knew exactly where to find the first grade classroom! The desks in my classroom were the same desks I sat in as a 1st grader. On my first day, I went into the storage closet and found my students’ books. 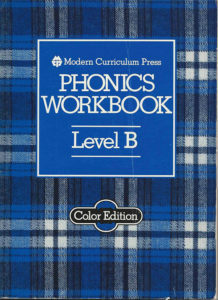 Oh look – a phonics workbook. I flipped through it and was shocked to immediately recognize it as the same book I used as a 1st grader! A different cover, but otherwise, exactly the same book! Yes, it was surreal. After these early teaching experiences, I married and began a family. I had a baby boy followed 3 years later by a baby girl. When they were young, I began taking a few graduate school classes. It was perfect timing because everything I was learning about reading and writing acquisition was being played out by my own preschoolers as they explored reading and writing in their play. They loved I Spy at the Zoo by Maureen Roffey and every Berenstain Bear book they could get their hands on. They both learned to read with the Random House series called Step into Reading. 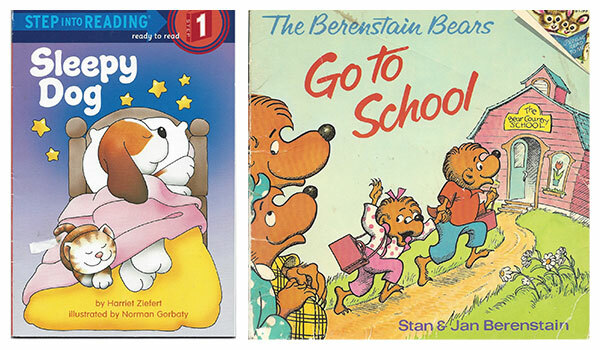 For both of them, the first book they actually read was Sleepy Dog by Harriet Ziefert. Thrilling for them and for me too. When they were a little older, we read all the Bill Peet books we could find in the library or bookstore. We were learning about the environment before it was a trend. During this time, I became a private tutor. I worked with lots of great kids who were smart and sassy but suffered because of their reading and writing difficulty. I remember one 15-year-old girl who asked her father to find her a tutor. When we met, she explained to me that when she was in elementary school, “I couldn’t read. The other kids made fun of me. Then they got to know me and they liked me so everything was okay.” Then she said, “I went to 6th grade. New school.” She explained, “I couldn’t read. The other kids made fun of me. Then they got to know me and they liked me so everything was okay.” Now that she was 15, she was headed to high school – another new school. Her story continued along the same track. “I’m going into 9th grade now. I can’t read very well. The other kids won’t know me so they will probably make fun of me. But once they get to know me, they will like me so everything will be okay. Can you help me read better?” I found this young girl to be like many people I would meet over the years. They are intelligent individuals with specific interests and lots of strengths. Most have developed elaborate strategies for hiding or handling their reading and writing difficulties. As my children got older, I studied more intensely, earning a Master’s Degree and a doctorate. Graduate school was a wonderful learning experience for me. In fact, I think that’s when I developed my own deep love of learning. I had many opportunities to teach college and work on research projects. I presented at professional conferences and did a lot of professional writing, all of which required a lot of reading. I enjoyed going to school and thought I might become a professional student. Read my next blog to see where I ended up.